“That’s it,” the unidentified cop yells before punching Emily Weinman at least two times in the head. A New Jersey cop who repeatedly pummeled a young woman in front of her baby daughter did so after she cursed at him and told him she couldn’t breathe, newly released bodycam footage of the violent Jersey Shore arrest reveals. “They’re choking me. I can’t breathe, you f—–g d–khead,” Philadelphia resident Emily Weinman screams as three officers hold her down. “That’s it,” one of the officers then yells before punching Weinman at least two times in the head — an onslaught that quickly went viral after it was caught on video Saturday. The beach-town beat down broke out after Weinman, 20, was spotted holding a beer, according to police. The violence has caused widespread outrage, with some viewers characterizing it as another case of police brutality. The Wildwood Police Department on Wednesday identified the three officers involved in the beating as Thomas Cannon, John Hillman and Robert Jordan. It’s not clear which officer punched Weinman. The bodycam footage showed Weinman screaming, spitting and cursing at the cops, but none of the three separate videos released Wednesday show her kicking an officer in the groin, which Wildwood Mayor Ernie Troiano previously claimed she did. Police Chief Robert Regalbuto said part of the incident wasn’t caught on video because the bodycam switched off when Weinman “forcibly struck” the officer in the chest. The camera turned back on in the ensuing brawl, Regalbuto said. Troiano said Wednesday Weinman landed the kick during the bodycam lapse. The mayor said the incident was “a shame” for everyone involved, but concluded the officers acted appropriately. At one point, Weinman cries out, “that’s my daughter,” as one of her friends approach cradling the 18-month-old baby. “He punched her in the face,” the friend tells the officers. 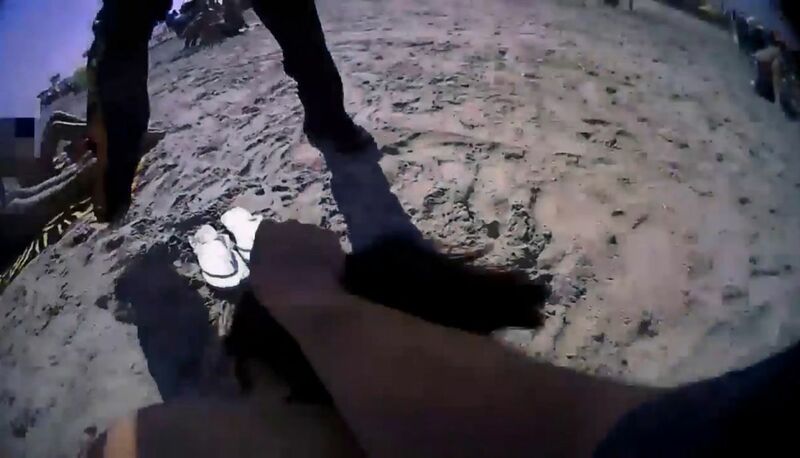 “Well, she tried to kick at us, so that’s it,” the officer with the bodycam responds. After Weinman is placed in the back of the car, the officer who threw the punches breaks down the incident to a fellow cop. The incident remains under investigation, Chief Regalbuto said, and the three officers involved have been placed on desk duty.